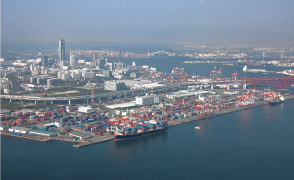 At the container terminals on Yumeshima and Sakishima, 9 terminals including C-1〜4, C-8, C-9, and C-10, C-11, C-12 comprehensively operated by DICT: Dream Island Container Terminal Co., Ltd. are in operation. 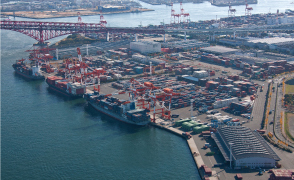 We are promoting efficient operation by integrating the operation of both exclusive and public terminals together with International Ferry Terminal. 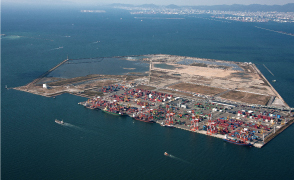 Service by two companies (one weekly, the other once two weeks) for Shanghai and 4 weekly services for Busan are available, taking some 70,000 passengers in 2016 as well as cargo handling 0.96 million tons in advantageous Hot Delivery Service per year. 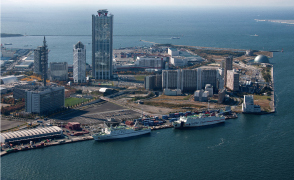 Copyright (C) Kobe-Osaka International Port Corporation All Rights Reserved.